Would you care to put your question in your post instead of your topic, or in the Questions Thread, or better yet, both? Celebi is at the end of Purity Forest. Jirachi is at the end of Wish Cave. If you need rescue, place your rescue request in the Mystery Dungeon Rescue Center. Purity Forest & Wish Cave are very tough places to get through, though. Please give me some strategies!!!!! Next, if you are going into Purity Forest, DEPOSIT ALL OF YOUR ITEMS IN KANGASKHAN STORAGE. If you are going to Wish Cave, I suggest you bring a Tight Belt or Pass Scarf to hold, bring lots of Reviver Seeds & don't forget to bring the access key to Wish Cave (Surf HM). For Purity Forest, try to avoid battles (don't try them, even if you want to recruit one from there, because they never join your team in Purity Forest unless the Pokémon is Celebi, which doesn't need a battle). If you get into a Monster House, run away or use Teleport (I recommend Teleport). If Teleport runs out of PP, don't worry. You should have found a Max Elixir while traveling through. For Wish Cave, do the same, except Wish Cave is easier than Purity Forest. If you prepared yourself, you should do fine . For Purity Forest, Alakazam is a must. Teach him every TM you find, and never erase Teleport - it can be a lifesaver in monster houses. For Wish Cave, I used a Frustration trick. I brought 4 Frustration TMs, a Link Box, and brought Lombre and Kyogre. Beforehand I taught Lombre Surf, which would free up one space in my inventory. Due to Lombre's ability, when Kyogre is near he will attack twice in the same turn, and only waste 1 PP. Frustration automatically does 45 damage once, and most creatures in the dungeon have less than 90 HP. Lombre's Item was a Tight Belt, so I neglected Apples the whole way down practically. At B99F, use the Link Box and link all 4 Frustrations together. Using them coupled with Swift Swim makes 45*8=360 damage. That KOs Jirachi in ONE shot. After that, just recruit it. Wish Stone is not worth it. Additionally, Lombre levels up very fast (50 exp just to lvl 2). I'm not sure about Ludicolo though. As for Kyogre just teach it every TM you can find. Leave Lombre's moves alone. After you exit, just go to Tiny Woods and bring a bunch of used TMs. Use Recycle and all TMs will be restored. It's 100% guaranteed to work if you do it right. I've used it dozens of times for Wish Cave and Purity Forest, and it's worked without a hitch. would it be alright if I ask for a suggestion team of Joyous Tower? Link the two Frustration moves with a Link Box. Teleport from unwanted foes and Monster Houses. Joyous Tower contains so many rare Pokémon inside. but I guess I get it from early dungeons like Mt. Steel. I'll post Wonder Mails for Frustration TM. Those are the Wonder Mail codes. They are in Tiny Woods. The reward is Frustration. Also, you should raise a Mr. Mime to Lv. 33 and it can learn Recycle so you can re-use the TMs. You can switch the moves around. Linking only links the two next to each other. To switch, I think you have to press the "Select" button. EDIT: i dont claim responsibility for discovering that frustration deals a fixed 45 damage (on minimum IQ), but it was my idea to link them together and also make use of drizzle and swift swim. i originally used kingdra as my swift swimmer, but other people figured out that ludicolo with swift swim + rain dish is even better. but kingdra levels up very quickly so thats also a plus, for the odd situation where you might need to survive an attack or two. Well, I see all of you want alakazam to battle in Lv.1 dungeons. 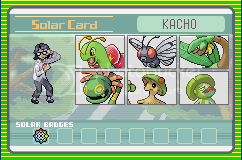 Well I cant have an alakazam yet so I use a Kecleon. Since Alakazam is a final evolution pokemon I guess its needed exp. points to level up is way to high.I did experience that I use once a Charmeleon but he needed 300 exp. points to next level but imagine gaining it but your gains are only 11,12 or sometimes 9. But Kecleon's needed exp. points at Lv.1 is 10 it last at Lv.3 then 20 its fast learning ability last to Lv.12 (I think because foe's change their it could have high exp.). when I'm in a monster house I move 1 step backward and battle so the style will be battling 1 by 1 (Foes can still see you). Dont worry about money I get a money of 10,000 ther so dont worry just dont buy too expensive items. You have a kecleon, but you dont have an alakazam? You do know how to get one right? I you have a kadabra, just offer a link cable as an evolution item. Ah... you see my style is I have to recruit 3 Abras making 1 will be an Abra then the 2 will be Kadabra and 1 will be an Alakazam. But I have 2 recruited Abras I let one evolve. because for me its easier if Purity Forest only for me because of no quicksaving in Purity forest.